Successfully Added Roll Up Synthesizer Piano with Responsive Keys to your Shopping Cart. For piano musicians on the go, brand new piano students, or people just wanting the latest and greatest in musical tech, Chinavasion presents this completely flexible synthesizer piano which can roll into a super compact design for storage and for moving. With 61 standard layout piano keys, 128 different synthesized tones to choose from, 100 different rhythms to play with, and other features like MIDI and Speaker OUT as well as a 3.5mm headphone jack, this portable piano synthesizer is comparable to any high end digital piano at a fraction the price and with so much more in gadget factor. A perfect gift for the musician in your life or as a highly resalable item, in stock and ready for your orders now. 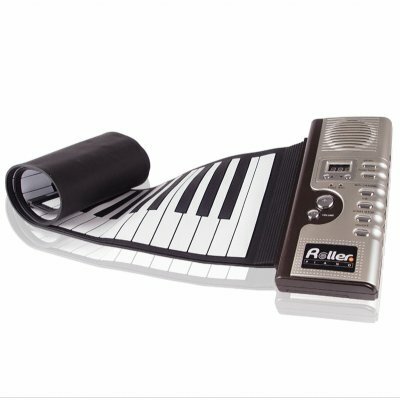 This product play full chords just like you do on a normal keyboard, but is intended as a amateur musical instrument instead of a professional device"
The responsiveness from the keys leaves a little to be desired, but overall a very effective and relatively safe toy for children. It's a full-on synthesizer and not "just" a piano, the sound quality and volume are decent. For the price, this is a super product. I am a pianist and my 3 year old loves my piano, but I wanted something a little less fragile for him to cut his teeth on until he is ready for the real thing. The quality of build is very good, the sound better than expected. There are slight let downs, but these are to be considered when purchasing something at this price point and portable, as to be expected. Clearly the keys aren't slick like piano keys, as they need to be flexible rubber, so the feel isn't quite right, although they have done a good job size wise and position wise. Regarding the technical side of things, I would have preferred slightly better sampling over multiple (over 100) synthesized sounds, most of which people rarely use and actual touch sensitive keys, however, as previously stated, I think these extras would make the item more expensive. It is perfect for children to get a feel for starting music without breaking the bank and without taking up a lot of space. Chinavasion service was great (to be honest, I was surprised, as this was my first order and I was a little suspicious!) and delivery was fast. Surprisingly good sound for something so portable. It's a great addition to my preschool music lessons.